Why are Potatoes Not Paleo? But yet, Sweet Potatoes are? Think it’s because Potatoes aren’t as nutritious as Sweet Potatoes? Well, then you’re in for a shock! Think it’s because Potatoes are more toxic than Sweet Potatoes? Well, again you’re in for a shock! So what’s the real reason for this, and is it even a good reason? Well, I think I’ve posed a lot of questions, and this article is going to provide some answers. For the nutritional aspect, I compared nutritional data for 100g of boiled potato flesh (no skin) and for 100g of boiled sweet potato flesh (no skin), using the numbers from NutritionData.self.com. The blue is potatoes, and the red is sweet potatoes. As you can see from the chart, the the amino acid profile of potatoes and sweet potatoes are actually very similar! In fact, potatoes have higher amounts of 7 out of the 18 amino acids profiled here: tryptophan, lysine, cystine, arginine, histidine, aspartic acid, and glutamic acid. And for the amino acids that sweet potatoes are higher on, potatoes are not much lower. Definitely not low enough for potatoes to be considered less nutritious than sweet potatoes. According to the chart above, potatoes have higher Recommended Dietary Allowances (“RDA”) percentages for 4 of the 10 vitamins featured here and hav the same RDA percentages for 2 of the vitamins (vitamin K and vitamin B12). If you are super observant, you will notice that I’ve left out three vitamins from the chart (A, D, and B12). The reason that vitamins D and B12 aren’t included is because neither potatoes nor sweet potatoes have any significant amounts of those vitamins. Vitamin A isn’t on the chart because it would go right off the chart! Sweet potatoes (the yellow and orange types at least) have huge amounts of vitamin A (hence their yellow/orange color, like carrots). Potatoes, on the other hand, have zero vitamin A.
Incidentally, the reason why neither potatoes nor sweet potatoes have any vitamin B12 (which is a seriously critical vitamin) is because hardly any plants have it, whereas it’s present in many animal products. So, if you’re in serious need of vitamin A, then yes, sweet potatoes would be a better choice. But other than that, there’s hardly any difference in their vitamin profiles. 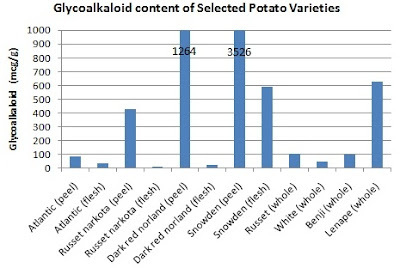 Potatoes have higher mineral RDA percentages for 4 of the 9 minerals profiled above, and have the same percentage for one of the minerals (magnesium). So again, there’s nothing to suggest that sweet potatoes have a significantly better mineral profile! As you can imagine, both potatoes and sweet potatoes are pretty similar in terms of calories (86 calories for 100g of boiled potato flesh and 76 calories for 100g of boiled sweet potato flesh). And they both have pretty much zero fat! Now comes the more interesting nutrient…carbohydrates. Although they both have similar total amounts of carbs (20g for potatoes and 17.7g for sweet potatoes), they differ as to what types of carbs they contain. While potatoes contain a lot of starch, sweet potatoes are high in sugars (particularly, sucrose and maltose). I’ll discuss the glycemic index of each tuber below, but just in terms of the amount of carbohydrates, there’s not much difference. There’s really not a huge difference in nutrients between potatoes and sweet potatoes. The main difference is that sweet potatoes contain huge amounts of vitamin A. So what is the Reason for Why Paleo supports Sweet Potatoes but not Potatoes? Loren Cordain (often considered the founder of Paleo) argues in both his books that potatoes should not be part of the Paleo Diet. The rationale for this stems from the following 3 reasons: (1) potatoes have one of the highest glycemic indexes, (2) most potatoes are consumed in highly processed forms, and (3) potatoes contain a toxin called saponin (also known as glycoalkaloids). These are actually 3 good points, but it doesn’t necessarily mean that potatoes should be written off altogether! There are varying data sets for glycemic indices (“GIs”) just like there is for nutritional values, but the fact is that potatoes definitely do have higher GIs. However, just how important is the GI difference? On average, white boiled potatoes have a GI of 82 where as sweet potatoes have 70. Baking can increase GI and the skin on both increases GI (according to data on www.glycemicindex.com). Different varieties of potatoes and sweet potatoes will have different GIs. However, if we look at the glycemic load (“GL”) instead (which is often considered the better predictor of blood glucose values), then there’s actually practically no difference! Potatoes have an average of 21 and sweet potatoes have an average of 22. Ultimately, if effect on blood sugar is something you care about (which many of us probably should worry about), then neither potatoes nor sweet potatoes are something you should be eating. Also, while potatoes can be consumed highly processed, so can a lot of foods permitted on the Paleo Diet (think various sweet potato chips and MSG-filled beef jerky). Clearly processed junk is not good for you, but I don’t find that a compelling reason to ban all potatoes! Saponins are toxins present in various plants (including spinach, oats, chick peas, beans, asparagus tea, onions, yams, garlic, tomatoes, and peppers) as well as potatoes, but the aren’t present in sweet potatoes. So exactly how much saponins do potatoes have and how to do they compare to other vegetables? Most of the saponins in potatoes are concentrated in the skin, so if we just don’t eat those, then boiled potatoes have around 27-42 mg of saponins per kg (see Stephan Guyenet’s graph showing the differences in saponin content between different potatoes). Tomatoes also contain saponins (just different types), and ketchup can have 8.6 mg/kg while small immature unripe green tomatoes have around 548 mg/kg (numbers cited by Loren Cordain). Then there are really high saponin containing plants, like asparagus. Data suggests that there would be around 15000 mg/kg (although most of this is concentrated in the stem)!! Spinach root contains even higher amounts of saponins (although luckily if you just eat spinach leaves, you won’t be ingesting much). So, it’s really unclear right now just how problematic the saponins in potatoes are, but if you’re looking to avoid saponins altogether, then there’s a lot more you ought to be worried about than just potatoes! For most of us, eating peeled potatoes should be fine! All the data seems to suggest that eating potatoes (especially baked or boiled and without the skin) is totally fine! I’m not recommending potato chips or French fries here, unless you make them yourself as a treat with coconut oil. But, there’s really no real nutritional difference between potatoes and sweet potatoes. And if you’re concerned with autoimmune and gut permeability issues, then you would be a hypocrite to just not eat potatoes but then keep eating all those other vegetables! It’s advised on the Autoimmune Protocol (AIP) to avoid all nightshades (there’s a comprehensive list of them here) and then add them back in gradually to test how you react to them. If you have an autoimmune condition, then you might want to try avoiding all nightshades (including potatoes, tomatoes, and peppers) initially. For more information about the Autoimmune Protocol, read this article. If you’re not familiar with Paul Jaminet and Shou-Ching Jaminet, then you should definitely read their fantastic book, Perfect Health Diet. It goes into a lot of science about ancestral diets and recommends that white rice and white potatoes are generally “safe starches” to eat. Their book was one of the things that prompted me to investigate white potatoes! Images: Copyright (c) 123RF Stock Photos SXC. Have you heard anything about purple potatoes? We get them in our co-op share and we do eat them occasionally. I read somewhere that they are 4x higher in antioxidants than white potatoes. I haven’t been able to find accurate nutritional data for them yet, but I believe they are similar in most nutritional aspects to potatoes. I’ve also read about the higher antioxidant contents, but I have not looked into it yet. Thanks Bethani – I’m glad it’s helping you! Would you have any info on why peanut butter is bad? I read somewhere it was also a lectin issue with potatoes vs sweet potatoes. Potatoes irritate my scalp somehow so out for me either way..
Hi Martin, you’re correct that potatoes do have lectins (I haven’t read whether sweet potatoes have lectins or not). However, I believe most lectins are deactivated by cooking, and since we hardly ever eat potatoes raw, they tend to be a much smaller problem. This is a fantastic article. I’d love to see the same sort of comparison but this time between winter squash and sweet potatoes! I think anyone who is healthy and has no problem with potatoes is fine to indulge. But I think you have some crossover information in your saponin-vegetable connection. The problem isn’t the “saponin” by itself but rather the “nightshade” family, which accentuates inflammation and autoimmune problems. Potatoes, Tomatoes, Peppers & Eggplant are all members of the nightshade family, and they all cause me pain (I have Rheumatoid Arthritis). But asparagus isn’t in that family and doesn’t cause me any trouble. It’s a scientific blur to get into all the chemical compounds, although the Paleo Mom has some articles where she certainly tried to explain it all. In the end, I like the n=1 experiment. Nom Nom Paleo loves her potatoes. Mark Sisson can’t eat them because they cause him joint pain. If you like them and feel good when you eat them, go for it. I did enjoy them for years before RA hit (I’m Irish-American, after all!) Potato love runs in my genes (unfortunately so does RA). Eileen, I completely agree with you that nightshades can cause a lot of problems for people with certain autoimmune issues, and for them, they should give up all nightshades (not just potatoes). The point of the article was more to clear up the myth that somehow sweet potatoes were healthy to eat but that potatoes were somehow not. Like you said, it is unfortunately a bit of a n=1 experiment. It’s hard to know if you can tolerate various foods until you take them out and then put them back into your diet. Thank you for clearing that up. I was confused after reading this when my experience is similar to yours. If I recall correctly, even Cordain has written that modern African hunter-gatherers derive significant calories from tubers. And aren’t potatoes tubers? That’s why they’re in my version of paleo. I did a similar nutrient analysis a while back and came to the same conclusion as you. No big difference except for the vitamin A, which isn’t that hard to get elsewhere. I can’t explain why sweet potatoes have the “health halo” effect, unless it’s because of other phytonutrients that aren’t listed above (antioxidant capacity, perhaps?). I don’t worry about glycoalkaloids, and I eat the skin. Thanks Steve, I’ll update the data this weekend! Thank you for posting this! Even though I’ve completely switched to sweet potatoes and even started favoring them over regular potatoes, I still think that there is nothing more satisfying than having meat with potatoes. Besides, growing up in Europe, it was all I ate and most people still don’t even know about sweet potatoes. Thanks Anya! Potatoes are definitely very popular in Europe. I personally used to love sweet potatoes growing up, but I find that my body tolerates potatoes way more that sweet potatoes for some reason. Actually sweet potatoes have a ton of Beta-carotene which is the inactive form of retinol, the active form of vitamin A. Only animal products, especially liver, contain a preformed Vitamin A. Thanks for pointing that out 🙂 I’ll make that clearer in the article – my understanding is that the body can convert that inactive form into the active form when it’s needed. Many autoimmune people including myself (celiac/hashis) cannot make the conversion of the pre-formed vitamin A into the retinol form. I’m not 100% certain but I think diabetics have a hard time converting too. I take cod liver oil and eat liver that way I’m guaranteed my Vitamin A without worrying if my liver can do it’s job. I do eat potatoes because hashi’s needs those carbs. However the gluten-free products are very high due to potato flour and toxic oils. I eat potatoes (both-white and sweet) with fat and vinegar to make sure they are digested slower and do not cause a blood spike and also eat them 1 time a week. Key is….everything in moderation. Anytime you eat a higher glycemic food adding fat or something acidic will slow down the transit time (so I’ve read). I always consume healthy fats with starches (and other foods too!) but was unaware of the role that vinegar plays in slowing down digestion. Can someone explain this? Does the kind of vinegar matter? I love vinegar! Thanks!! If you peal the potatoes to avoid the saponins, does the bulk of any of the the vitamins or other nutrients get discarded with the peal? All the nutritional values in this article are for potatoes without the peel. You left out one of the best reasons to eat white potatoes over sweet potatoes: resistant starch. RS is almost completely absent from the paleo diet, including potatoes, especially cooked and cooled potatoes, adds some back in. One of the highest concentrations of RS is found in raw white potato. Here’s my RS Rx: Eat potatoes every day. When cooking, eat a few slices raw. Eat some cooked and hot, eat some cooked and cooled. Different ways of cooking effect the RS–roasting at high temps preserves RS while boiling destroys it. The SAD eaters get about 3-5g/day of RS. LC Paleo get 0-1g/day. Paleo+Potato (ie Perfect Health Diet) eaters can get nearly 10g/day following my method. Many sources recommend 20-30g/day, hard to do, but not impossible. Raw Potato Starch is 78% by weight RS. 1TBS provides 8g RS. 2-3TBS of raw potato starch (unmodified) is easily added to cold dishes like potato salad, fruit salad, or included in blended drinks/smoothies. If this sounds foreign, do a Google search on Resistant Starch and you will be a convert! Thank you Louise for the research and well written post. I totally agree with you! This is sooooo insightful. It’s neat to see a side-by-side comparison of these tuber cousins. Given the research presented and my sensitivity to insulin, I think the advice to avoid both is sound! Thanks for sharing! I’m sharing this with Facebook fans too! Somewhere I have heard that white potatoes have a 50% sugar conversion. So if you were to eat 1 cup of white potato, it would turn to 50% sugar in your body, in other words, the equivelant of eating 1/2 cup of sugar. I heard it on a Pod Cast and am not sure of the info they had to back it up though. That might be worth looking into. The reason they’re not allowed is because they can hinder weight loss (more carbs), and the Paleo diet gurus BANK on the fact that this diet becomes popular via the weight loss crowd, and not by the health eaters. So taking potatoes out of the equation was a strategic movement rather than a nutritional one. What a great article particulary when I cant stand the taste of sweet potatoes and avoid them like the plaque. I have never stopped eating potatoes, its just not possable with English/Irish genes! Interestingly and thankfully potatoes and tomatoes have no side effects for me and I have RA also. i’m so glad you posted this, louise!! i’ve been reading a lot about resistant starches and found that cooked and cooled potato has the highest amount out of veggies. i plan on making some potato salad soon. might even be good as a sweet potato salad, too. the possibilities are endless! Thank you so much for clearing up this major question in our house! We are relatively new to Paleo and haven’t been able to find good reasons in favor of or against white potatoes. Our instructor, in a crossfit nutrition class, said white potatoes were fine, without the skin, after our 30 day challenge; but, we were sceptical. Thank you for confirming what he said! We just bought some white potatoes last night and as meat and potato fans, can’t wait to add them back into our diet! Well, I am just all over the place in your blog emails today, aren’t I? Thanks so much for all of this info, it’s good to know and we can make our own choices. I never knew where to even start on such detailed research..I love taters (as we call them here)…and I have had them occasionally anyway, but now I won’t have to feel anti-Paleo when I eat them in the future. Luvd your article! Has anyone tried the Japanese Sweet Potato? We get them at the Asian market (a lot cheaper) and they are incredibly sweeter than a US Sweet Potato, but white on the inside and has the texture of a russet potato. So delish! They are small and can fit it in your palm, which make it a perfect size. The Japanese sweet potato is my favorite potato! If it where not for potatoes, I would not be alive today. During WWII, living on the outscrurts of Berlin, Germany, I survived on potatoes and weeds out of the fields which my grandmother prepared daily. About 1 meal a day for 2-3 years. I am pro-potatoes, and still love them boiled with some home made gravy (a little salt is all I got as a kid). I also take potato starch daily (RS), which has for the first time in years brought my fasting BG down to below 100. Thank you for this info! I always appreciate your well researched articles!